I appreciate the willingness of Dr. Reddy to voice concerns with the potential strike and to advocate for the rights of undergraduate students. Despite the fact that a strike is now much less certain, I would like to offer a clarifying response. My understanding is that the university has a robust set of protections for the material consequences of withheld grades and that undergraduate financial aid, scholarship status, and ability to graduate on time would be essentially unaffected by any strike. This was certainly the case during the 2001 strike, when I myself was in my first of two senior years here (the graduation delay in my case was entirely of my own making). That said, the effect of a strike on our undergraduate students has been a major concern of ours and a large portion of our pre-strike discussions has centered on finding ways to ensure that students’ work is honored and that no one slips through the cracks. It also bears mentioning that there are two sides to this labor dispute and that administration could prevent anxieties over students’ education by offering a fair contract, effectively ending any strike threat, and that this could have been done weeks ago before our contract expired. 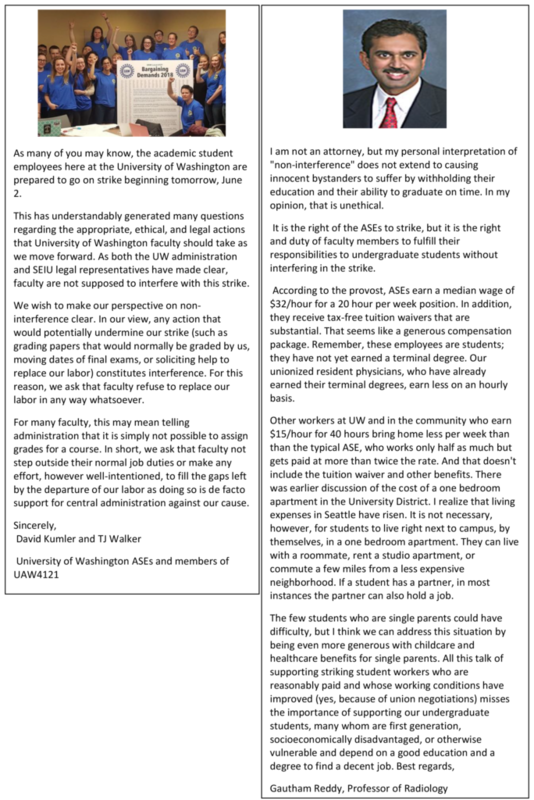 Our demands have not been extravagant, and indeed we feel that they are in the long-term interests of all students at UW, undergraduate as well as graduate. It is important to recognize that our students’ educational well-being is not confined to the grades they receive at the end of one quarter. Our hope was and is to influence the financial decisions of the university in a way that emphasizes classroom needs, starting, of course, with many of the teachers who are in those classrooms day-in and day-out. In English, we end up teaching, at some point, very nearly every undergraduate who comes to UW, and my colleagues and I have overwhelmingly received loud and repeated support from our undergraduates over the course of these negotiations. For those interested, a list of our initial demands in broad terms can be found here, and a running log of more specific proposals made over the course of bargaining can be found here. Wages that simply keep pace with the prospective cost-of-living increases in Seattle, protections for those experiencing sexual harassment, departmental equity trainings, fixes to gross deficiencies in the way mental healthcare and trans healthcare have been rendered, additional childcare subsidies for student parents-these have been some of our core demands over the course of these negotiations. To put the administrative response to our demands in perspective, and to contextualize Dr. Reddy’s accurate assertion that more needs to be done to support students who are also single parents, here is one example of our difficulties in bargaining: We asked for an additional $35,000 per year to be made available to student parents for relevant childcare expenses (since the current fund of $45,000 per year has been tapped dry each of the last several quarters, leaving many with no support). Even after our one-day strike on the 15th, the administration’s offer remained to increase this fund by $5000 dollars, less than half the price of Provost Jerry Baldasty’s retirement buffet. Now, I am not suggesting that we stop honoring retiring members of the UW community, nor that we should entirely give up nice buffets! As a grad student, I have certainly availed myself of any and all opportunities to get free food. My point is simply that this administration requires a great deal of pressure to be moved even on common-sense improvements with a relatively minimal (by the university’s standards) cost, and even when a great majority of us (pro-union or not) see these demands as important and necessary for a safe, inclusive, and equitable campus. It was only the threat of a longer strike that eventually forced the administration to increase childcare subsidies to $60,000 per year in their last, best, and final offer (still significantly short of the perceived need). Of course, it is up for debate whether or not our current employment situation is generous or will remain generous with rising costs of living (the university’s initial proposal was a 0%, 1%, 1% wage increase over the next three years, with increases in fees that would heavily outweigh this very modest increase-their most recent, final proposal was a 2% increase over each of the next three years-less than the projected increase in rent for most of us). We certainly recognize that there are people in the area who are having an even harder time than we are. Many of us were heavily involved in local actions to raise the minimum wage to its present rate. We student employees are not all paid at the same rate, we do not all have the same job duties, and we obviously have different financial means prior to coming here. Our aim has always been to protect the most precarious and our wage demands only apply to the “base rate” TA salary. This means that those departments who are already being paid significantly above the minimum would be under no obligation to increase pay (although I am sure their workers would appreciate it if they did). In my department, English, I know several people who commute from as far away as Everett and Tacoma in order to live in decent, (somewhat) affordable housing. Until recently, my partner and I lived in a cockroach-infested 1-bedroom, commuted about 45 minutes door to door, and our rent was still nearly $1100 per month. Despite our “50%” status, a great number of us are either coerced by our departments into working significantly longer hours, or do so of our own will because the teaching situation we are in demands such work or our students will suffer. I have routinely posted 40+ hour work-weeks teaching my composition classes, despite the fact that this is “not recommended,” because I am a deliberate grader and I, like my fellow student workers, care profoundly about my own students’ education. The bottom line is that the administration’s contract offers are trending in the wrong direction, and while it is true that most of us can survive by adding roommates and, as President Cauce has implied (hopefully in jest), dining on ramen, graduate students here at UW increasingly need to be financially independent before starting PhD work and this has an obvious and drastically adverse effect on the university’s ostensible mission of promoting equity and diversity in knowledge production. Those of us who are a little better off would be far more likely to accept the de facto pay cut that the university’s last, best offer represents if there were some concrete and credible evidence that the university had more pressing priorities for its 7.2 billion dollar annual budget. The budget allocations are not clear, but what is clear is that a great amount of money is being spent on things that we prioritize less than the research and teaching work that we do. In this sentiment, at! least, I expect we are in close agreement with many of our faculty colleagues, despite our differing positions in the academic hierarchy and the different tools that we have to enact change. Dr. Reddy, I appreciate your mindfulness of the quality of education we offer our undergraduate students. However, I do not think graduate students should unduly bear the burden of ensuring a quality of education for our undergraduates. Graduate students can be fairly compensated while undergraduates are well-served. As someone who completed at PhD at UW in 2014, the struggles of UW graduate students are fresh in my memory. I recall that it was unusual to meet a graduate student who only worked the contracted 20-hours per week. The tasks assigned to TAs and RAs were difficult to complete in 20-hours, and those who stopped at 20-hours would not perform well at their job and could risk losing funding. Those of us who taught were passionate about serving our students, and overworked ourselves to pick up the slack as students were undeserved by the post-recession cuts to tutoring centers and increases in class sizes. In my own case, I was a TA in name and salary only, as were dozens of my graduate student colleagues in the English Department. I arrived with a master’s degree and taught my own complete courses without the salary or professional development resources granted to tenure-line professors who taught some of the same classes. I had two additional part-time jobs and lived with four roommates in order to afford to live in Seattle during this time, and the cost of living has only gone up since then. I’m not sure how closely faculty follow rental trends in Seattle, but moving to a neighborhood with cheaper rents could entail leaving Seattle or even King County all together. According to HUD, fair market rent for a studio apartment in the Seattle-Bellevue area is now $1363. I don’t know the median rate for renting a a room in a house, but glancing at Craigslist, I see very few options near UW for less than $800 a month. Graduate students seeking cheaper rent could be looking at 2-hour+ commutes from Piece, Kitsap, or Snohomish. that it is not faculty’s job to break the strike by helping management.